Maddux, L. (2018). Source attribution in ASL-English interpreter education: Testing a method. International Journal of Interpreter Education, 10(2), 27-43. Maddux, L. (2017). Interpreting in the zone [Review of the book Interpreting in the zone: How the conscious and unconscious function in interpretation, by J. Hoza] Journal of Deaf Studies and Deaf Education, 23(1), 109. Maddux, L. (2018, July 22). Source Attribution. Presented at RID Region IV in Albuquerque, NM. Maddux, L. (2018, July 21). Academic ASL. Presented at RID Region IV in Albuquerque, NM. Maddux, L. & Nicodemus, B. (2017, April 1). The committee in my head: Examining self-talk of American Sign Language-English interpreters. Poster presented at Interpretation and Translation Research Symposium in Washington, DC. Maddux, L. & Nicodemus, B. (2016, July 22). Committee in my head: Self-talk in ASL-English interpreters. Presented at Texas Society of Interpreters for the Deaf in Houston, TX. Maddux, L. (2016, July 22). Source attribution: Research and practice. Presented at Texas Society of Interpreters for the Deaf in Houston, TX. Maddux, L. (2016, July). Testing our teaching: Data-driven evidence for interpreter education methods. Presented at Critical Link in Edinburgh, Scotland. Maddux, L. & Nicodemus, B. (2016, June). The committee in my head: Examining self-talk of American Sign Language-English interpreters. Poster presented at Critical Link, Edinburgh, Scotland. Maddux, L. (2014, November). Interactive interpreting: Teaching and learning techniques. Presented at Conference of Interpreter Trainers in Portland, OR. Dr. Maddux has been involved with the Deaf community for more than 20 years. She is certified at the BEI and NIC Advanced level, and has been interpreting for more than 14 years. 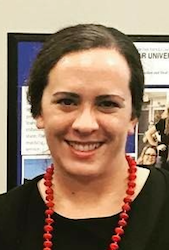 In addition to her focus on testing and improving instruction methods for interpreters, Dr. Maddux is also interested in Turkish culture and people after living and teaching English there previously. In 2015, she was the co-chair for the World Association of Sign Language Interpreters Conference (WASLI) in Istanbul, Turkey, and she is a volunteer coordinator for WASLI for Paris 2019.